Hello, hello, hello, Mitakiharrrrrrraaaaaa! 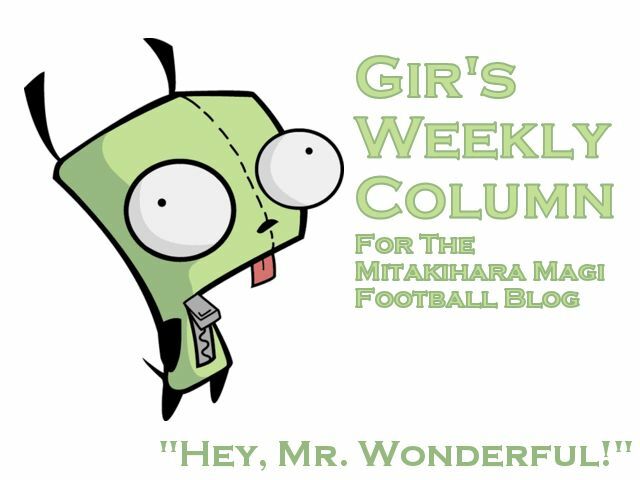 This is Gir Todafunk, with another of my weekly columns for the Magi Football Blog, courtesy of the Daily Magi. I have a special announcement to make in 3...2...1. That's right: we are days away until the 2053 college football season gets going. W0000t! And we are ranked No. 3 in the preseason polls! W0000000t! Actually, that not a good thing; we should be No. 1 but trolling voters gonna troll. B000000. Anyway, no really, I am hyped up for this college football season because I want to finally get out there and hit someone, pick off a pass or at least swat a ball. Instead, we are confined to the air-conditioned confinements of Hakurei Centre, which is also now where the BC Lions occasionally train during the winter because the artificial surface can host Canadian football games as well as American football games. Well, other teams also use this facility but it's generally used for the football team. Us and the sprint football team, so, yeah. It's like, everywhere I go I see rose, pink and white streamers. I see people wearing pins, T-shirts, sweaters, jackets, even underwear with Mitakihara's logos on it. It's developed into quite a global brand, hasn't it? It's crazy. I went to this one souvenir shop on Laurier Road in downtown M-Town that caters to tourists, and they feature postcards of the Madoka Union building, which looks like a ragdoll out of blocks, but that's actually a super-deformed version of the chancellor, Dr. Madoka Kaname, in her younger years. It's like she's watching over the city from a distance, and the photo I was holding—which I eventually bought—saw the building watch fireworks in the distance going from from downtown. And all those shiny illuminating skyscrapers could be seen. Mitakihara full of bright lights and dazzling architecture. We have it all. That's why I love living here. I think we have way more skyscrapers than New York and London combined. You see, people used to come to Vancouver Island just to get away and relax. Well, ever since Mitakihara was founded, now everyone wants to come to my city to gawk at the architecture, do business, eat out, shop till they drop, maybe even stay for a weekend or week or two...it's grown into one of the hottest destinations in Canada. I mean, in a recent report from Maclean's, over 20 million international visitors visited Mitakihara in 2052. That's way more than Bangkok, who clocked out with 17.05 million international visitors. And many of them come to this university to watch the home team crush their opponents. Tell me one other city that can reach 20 million international visitors over the course of a year. That's right. You can't. Mitakihara Town tries its best to be awesome, and it does it with style. There's just something about the spirit of its place that make you want a piece of it. Anyway, I'm seeing this one huge countdown clock on one of the walls of the Madoka Union, and while it's showing highlights from last year, it's also showing a live countdown before the game against Texas A&M. Right now, my mind is fixated on beating the Aggies and knocking them off their perch. We got some really, really good players on offense that can deliver. You all know about Haruyuki Arita, the Pig, and his shiftiness and his vision. You all know about D.W. Hinoi and his versatility and athleticism. And don't forget about Takumu Mayuzumi, El Capitan, who has the reliability and hands to make big plays, and can block to boot. Hearst has been telling me that he wants the ball a lot. He's our starting fullback and he was excited when he was told that he was at the top of the depth chart. I think Coach Kaname wanted to do that so that he would be happy with his playing time. Hearst, who I call "Hunter," a reference to the famous wrestler Triple H, can not only block: he can run the ball and he can catch the ball. Really, Hunter's just a glorified halfback. All the power of a fullback, all the grace of a halfback. He can do it and I expect that he will deliver, as usual. So that is this week's column from yours truly. Next week, we're off to New York City to prepare for Texas A&M. Boy, that will be something. Til next time, this is Gir, signing off. You are not alone.